March 2017’s median sales price of $420,00 was up 5.3% or $21,000 compared to last year. 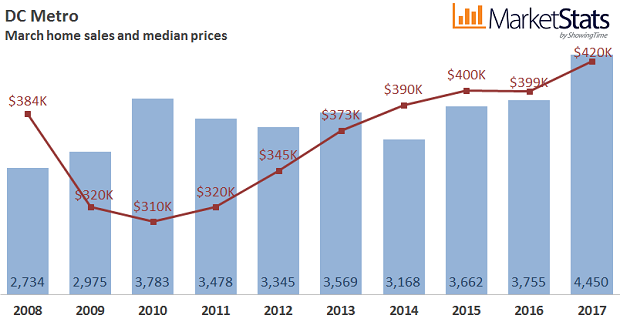 This is the highest March median sales price of the last decade, easily topping the prior high of $400,000 seen in 2015. 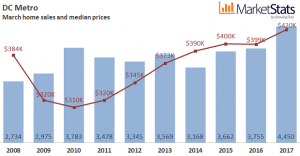 Sales volume across the DC Metro area was nearly $2.3 billion, up 26.7% from last March. Closed sales of 4,450 were up 18.5% compared to last year. It was also the highest March level in a decade and easily exceeding the 3,755 sales recorded last March. New contract activity of 6,254 also reached a ten-year March high, increasing by 1.4% over last year.  New listings of 8,210 were down 1.7% compared to last year. Active listings of 8,648 are down 11.5% compared to last year but up 15.3% compared to last month. This is the eleventh consecutive month of declines in year-over-year inventory levels, and inventories are at the lowest March level since 2014. The average percent of original list price received at sale in March was 97.9%, up from last year’s 97.1%, and also up from last month’s 97.4%. This analysis of the Washington, D.C. Metro Area housing market was prepared by Elliot Eisenberg, Ph.D. of MarketStats by ShowingTime and is based on March 2017 MRIS housing data.